'Inspired by a Catalog Page' card. Blockheads is sponsoring a Bleach Technique challenge right now and if you submit your creation URL by March 21st, 2012, you could win a $25 gift certificate to the Blockheads store! The winner will be selected by our Design Team. I did my bleaching on an image from the amazing stamp set called Nature Medallions. 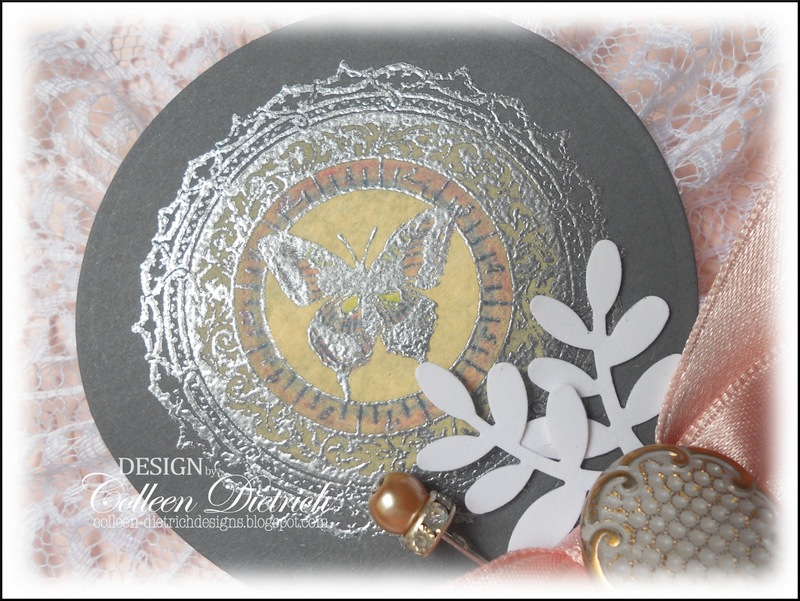 On gray cardstock, I stamped the butterfly-in-medallion image with Versamark ink, sprinkled on silver embossing powder, and hit it with the heat tool. When the embossing was cool, I used a small paintbrush to paint on bleach straight from the bottle (good old-fashioned Clorox). The bleached areas turned a buttery yellow; so pretty! Then I colored in some of the areas with watercolor pencils and used a circle die cut to cut out the image. I used some old gathered lace ribbon and adhered it behind the circle with Scor-Tape, then mounted on the card base with dimensional foam stickers. The base is Blush Blossom cardstock that was embossed with a Cuttlebug folder from the 'Love's In The Air' Collection, then the edges were sponged with Tattered Rose ink. The ribbon is from the scrap bag, and just happened to fit the colors perfectly. :) Love when that happens. I sewed a vintage button to the center of the bow. A couple of Rock Fern Punches add interest to the bow, as well as a pearl/rhinestone stick pin. Now this is fun too. I have not done the bleach technique before but it looks like fun. I don't do bleach well I tend to get it on things I would rather not get it on. So what if are socks are dingy! Nobody should be looking up our pant legs anyway! Can you use a bleach pen? Well, I have one stuck between the refrigerator and the cabinet which the basset managed to knock it down there. I had used one on the sink at one time and had bought another. Beautifully embossed image and a lovely card. Beautiful Colleen! 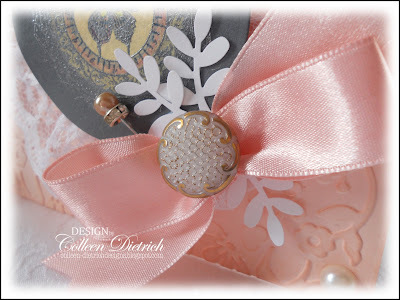 Love the soft pretty pink, the lace, the embossing, and that gorgeous medallion! I forgot about bleaching! It adds a richness to the center! This is so beautiful Colleen! Love the beautiful pastel pink ribbon...so smooth and silky and your bleach technique is amazing! Well done! This is an amazing technique. I love the outcome, but always shy away from bleach. I can't count the number of things I've ruined with a drop of bleach misplaced. LOL, It scares me. Your card is beautiful, Colleen! WOW!! Now that sounds like a fun technique. Your card is so pretty..
How fun to see what the bleached color will be - wouldn't have guessed yellow! Neat technique! such a pretty card Colleen. Love the colour. The bleaching technique sounds fun. what a fun technique. I have to try it. Love your beautiful card. I saw your card in the magazine. Love your different styles. Love the peach! How cool that the gray turned a yellowish color! Ah, a wonderful technique and it made such a gorgeous card...with your help, of course. :-) That pink satin ribbon is yummy and soooo perfect. Love your card! Very, very pretty, Colleen! That pink is so sweet! Love the ruffled lace! Gorgeous card Colleen. That a neat technique. Lovely images and colors. The embellishments are so pretty! Beautiful cards Colleen! The silver embossed images look fabulous! So elegant looking! Absolutely beautiful Colleen, the colours are so yummy! Great job! Well hun I almost fainted....this is one of your best cards ever and I'm smitten. So subtle and elegant. It's a style that I love and you do this so well. Lovely to look at; wonderful job. Wow! I know you always have such pretty cards, but when the picture of this card came up I was stunned. It is so soft and romantic with the light color and lace. I will have to try that technique when I get some spare time!! Stunning! So soft, delicate and elegant! Great technique too, I'll have to try it out!